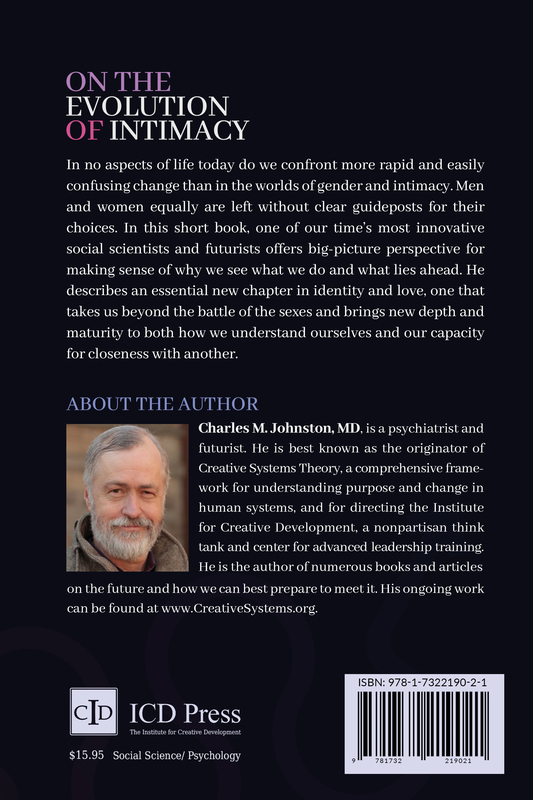 In On the Evolution of Intimacy, psychiatrist and futurist Charles Johnston addresses how our times are making possible a critical “growing up” in how we think about intimacy and gender. With regard to intimacy, the changes he describes are as significant as those which brought us Romeo and Juliet–style romantic love. With regard to gender, what he describes takes us beyond both the polarizing assumptions of traditional gender roles and the simplistic conclusions of a postmodern unisex ideal and offers that we might think with a whole new kind of sophistication. From the author: “This book had its origins in rich conversations sparked by the #MeToo movement and the like. In my role as a psychiatrist and futurist, I respond to potentially polarizing front-page-news issues by attempting to write about them from a more systemic vantage. When I tried to address current gender- and sexuality-related concerns in this way, I quickly realized that more than a short article would be necessary. I saw that these were questions that would require big-picture, historical perspective. This book was the result. 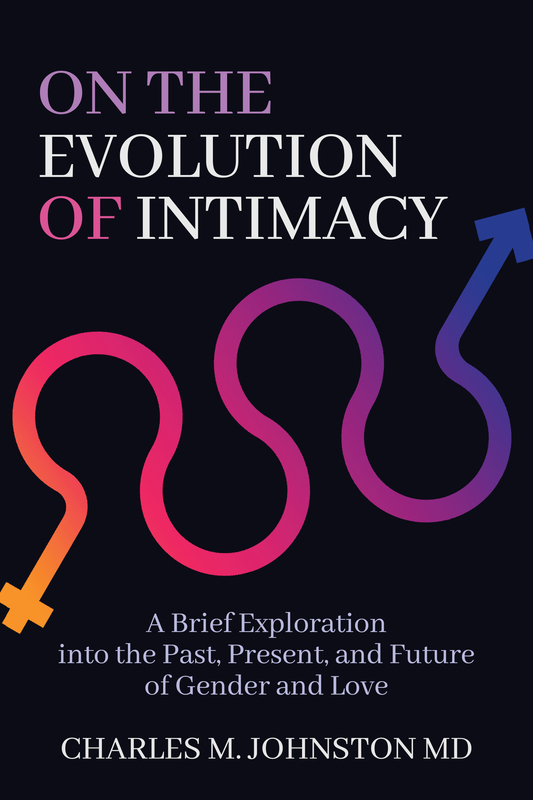 On the Evolution of Intimacy applies the notion of a needed, and newly possible, “growing up” as a species—what Dr. Johnston calls Cultural Maturity—to some of today’s most important and fascinating concerns. The book expressly supports today’s new gender-related conversations, but it also suggests that more is needed. It proposes that most of what we see today, with its focus on equal rights, equal opportunity, and equal safety for the sexes (particularly for women) is better thought of as a last contribution of the modern age project introduced with the Bill of Rights than an expression of Cultural Maturity’s further changes. Dr. Johnston lays out important new lessons for men and also important lessons for women as we look to the future. He also suggests that a useful litmus test for success with culturally mature changes is men and women better understanding the unique challenges that each faces and also better appreciating the unique gifts that accompany meeting those challenges—in effect, a reconciliation of the historical battle of the sexes. 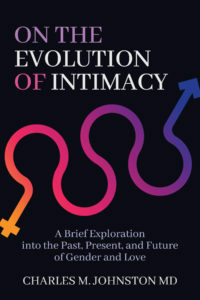 On the Evolution of Intimacy has it roots in the thinking of Creative Systems Theory, a comprehensive framework for addressing purpose, change, and interrelationship in human systems developed by Charles Johnston and colleagues at the Institute for Creative Development. Because the book draws so directly on the theory for understanding both history and the defining questions of our time, its insights provide important support for Creative Systems Theory as an overarching framework for understanding the richness and dynamism of the human endeavor.